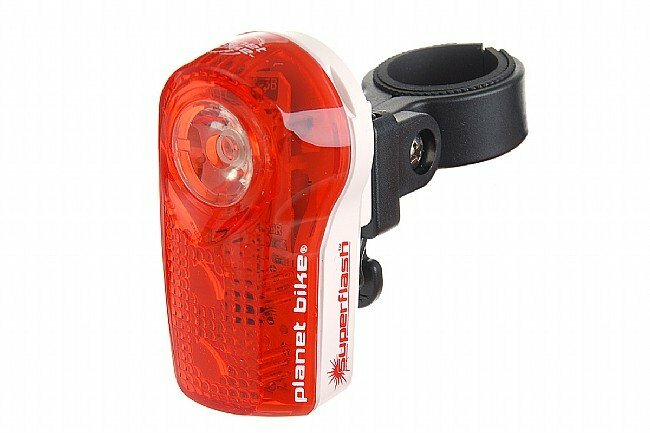 Planet Bike's Blinky Superflash Tail Light is the brightest battery powered tail light on the market, with maximum visibility in a compact, durable package. Includes bike mounts and clip mount for multiple mounting options. I wouldnt go past my driveway without proper lighting (F&B), and this light throws a nice pattern of flash that is visible for quite a distance. With cell phones and GPS, cars and trucks need to see you as far in advance as possible ! I enjoyed the use of this tail light for about a year. Last week, as I was riding over a bridge, I heard a sound. I stopped and discovered that the front half of the light separated from the rear, which was still attached to my under-seat bag. Apparently the press-clip attachment of the halves failed, sending the tail light over the side of the bridge. So now, I'll be shopping for a replacement and with a more critical eye on construction. I can't really add anything about the positive features of this product. After getting stuck out in the (unexpected) fog I started to dwell on getting some type of tail light. It also hit me like a ton of bricks that instead of trying to dress like a circus clown with my slightly garish jerseys that a tail light would make perfect sense in my neck of the woods. I ride narrow back county roads with narrow or often no shoulders. Even during the summer months there is a lot of shade, depending on the time of day. I realize that I am not completely visible. I researched the heck out of tail lights and the Super Flash was high on the list. The only weak link is the mounting system. The screw for the mount is small and I almost stripped it. The slot is small and won't take much messing around with. Makes switching between bikes rather bothersome, or impossible. Portland Design Works uses the same mount for their tail lights that is tool-free silicone rubber ($6.00). I purchased one of these and it is a better mount that comes with the Super Flash. Just clip it on the seat post and you are good to go. No tools needed. I don't know if the good folks at BikeTiresDirect will even print this, but this would be a good product for you guys to offer. Either than or Planet Bike needs to offer the same type of mounting system. Only prob is it is only good for a seat post mount. Incidentally- I tried to mount my Super Flash on my seat stay, the tapered stays on my frame would not allow this, unless it was mounted very low and I did not like that position. I gave it 4 star over all rating because of the mount. Otherwise it's a 5 star. Good product. The tail light is bright and highly visible from a distance. I feel much safer riding the roads with this high visibility tail light. It is very important to be as visible as possible riding in busy traffic. 16 of 19 customers found this review helpful. We sell more of these tail lights than all the others put together. And for good reason. This light is not only very bright, but the flash pattern and white LED with lens make it very easy to see from a considerable distance. 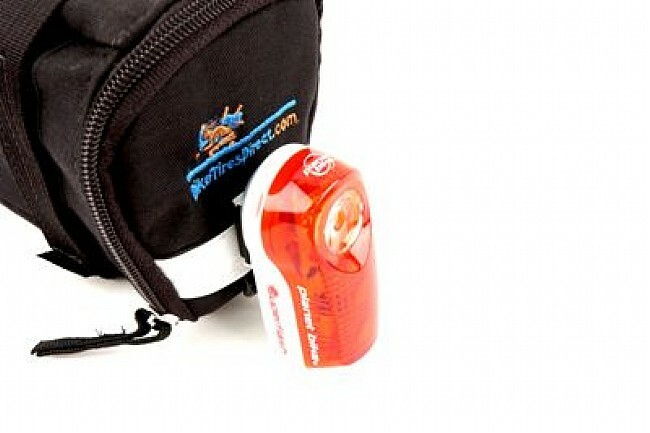 If you don't want to spring for the Dinotte Tail Light, this Planet Bike Blinky is the one to get. The light is fairly light and mounts easily on a seat tube. The AAA batteries last a surprisingly long time. In my experience, it stands up well to weather although we have had a few customers report problems with leakage but this is out of many hundreds of customers. Long distance visibility with this one ! Have this same tail light on my road bike, added one to my trail bike. With all the texting and phone usage happening, I want to be seen ! I have used 2 of these. The first one worked great until after a few years I noticed it stopped working when ridden in rain and wet conditions. Then I got another one thinking the first one was just old but the new one is suffering the same problem. When I open it up you can see water inside it. If I let it dry out it starts working again. It works fine when its dry. Its actually a great light when it is working. But rainy conditions is one of the times that I need the light the most so I can't have it not working in the rain. I bought a Nite rider light that claims to be waterproof. This light is bright and the batteries last a very long time. I ride 3 days a week and always use it since I ride on hy 12 so the traffic is fast. Replaced a couple that were stolen, I keep buying 'em so they must be good. Good, solid tail light, no complaints here! I use this light on my bike home from a late night class (or when the weather is icky and I want to make sure I'm visable). It comes with a number of options for clipping to the bike, different types of bags, or I've even clipped it to the back of my pants in a pinch. It's got different options for flashing or solid light, which is nice. Very convenient that it takes a normal type of battery that I usually have at home, so I don't have to go in search of some special battery when it starts getting dimmer. Finally a stealth version! Huzzah! I love the black and clear model it blends in perfectly with my road bike (black and white graphics). I own tow of these, one for my bike and one for my wife's. While other lights have worn out after a few seasons, Planet Bike's tail light just keeps working. The light is very bright and the store setting is perfect for riding during the daytime. A set of batteries lasts a long time, too, thought the light is brightest with a fresh pair. This must be the one of the best ones out there, because I see it on so many high-dollar bikes. When I purchased it, I thought it was a cheapo, crappy taillight that would just be a token safety measure. Turns out it packs a punch! This sucker is BRIGHT. Of course, on a clear sunny day, don't waste your battery, wear day-glo clothing instead. But at dawndusk, an overcast day, or darting in and out of the shadows, this light has your posterior covered. My favorite feature is that it takes basic AAA batteries, and they last a LONG time. Not very bright during day time. I was hoping this light would be bright enough to make me more visible during day time, and hence incite motorists to give me the 3 ft space. It is absolutely useless during day time. Light mounts easily and the strobe is highly visible. I use it for every ride especially early-morning rides. Works great I would recommend this for any rider. I would have given the older versions of this light a 5 star rating even though they were subject to leaking in the rain and the switch would corrode. Planet Bike has always stood behind these 100% and have replaced the few I sent them. However, the newer version of this light is much improved and the switch is redesigned and more corrosion resistant...now it's a 6 star. I like the fact that it is battery operated and NOT rechargable...just more dependable. They are cheap enough where I always use two...one on my helmet and one of each of my 3 bikes. They just work great. Easy to install, doesn't come off when hitting large bumps, nice and bright, perfecto! Use it for most club rides in Westchester, NY and is nice and bright with various settings and battery seems to last. This is an excellent, potentially life saving product. When I ride on the road, in the fog, at night, I'm no longer invisible. Needles to say, it's also very good in daylight because it really is that bright. This is an inexpensive, simple, and easy to mount product that will increase your visibility to those inattentive people driving tons of bicycle crushing metal. Spend the money and feel a lot more confident on your rides. I've been using PB Superflashes for years, while commuting and recreational rides. For the money, it is hard to beat. There are brighter taillights but they cost more and their batteries don't last as long. The main drawback to the SF is that the on-off switch can be fickle to operate. Sometimes it's hard to activate or turn off, or it cycles through more than one mode. On the plus side, the SF lasts a very long time before the batteries need to be recharged or replaced - much longer than other lights I have used.